Rear row – Ptes S Laird, P Cloke, WE Voden, CMS Gosling, Sgt. R Featherstone, Pte. TD Frayne, Cpl. GR Hill, Ptes FJ Clements, G Waldron, J Lock, Cpl. F Stacey, Pte R Raymont, Cpl. EJ Moyes. Third row – L/Cpls. FD Miles, F Clarke, Cpl.RC Halbert, Cpl. R Day, Ptes C Kelly, W Weedon, J Oliver, Cpl H Mounce, Ptes SJ Short, AC Waldon, E Symonds, L Braund, A Tuplin, Cpl.A Huxtable,Cpl.F Rockey, Mr.E Brown. Second row – Sgt. S Hawkins, Pte .R Cade, Sgt.R Northcote, Sgt.TR Harding, Major Cudmore, 2/ltd WH Pascoe, Lt. C Brough, Capt. JR Ellis, 2/Lt. H Sherbourne, Sgt. F Clarke,Sgt.JH Hillman, Sgt. L Short. Front row – Ptes. R Webb, C Tryon, R Raymont, L/Cpl. ER Youngs, Ptes H Lee, WW Horn, M Vanstone, CW King, Cpl. SC Smalldon. This entry was posted in History and tagged bideford, Home Guard, WW2. Bookmark the permalink. One Response to Bideford Home Guard, 1943. I was surprised and pleased to see this photo in the Bideford Buzz. 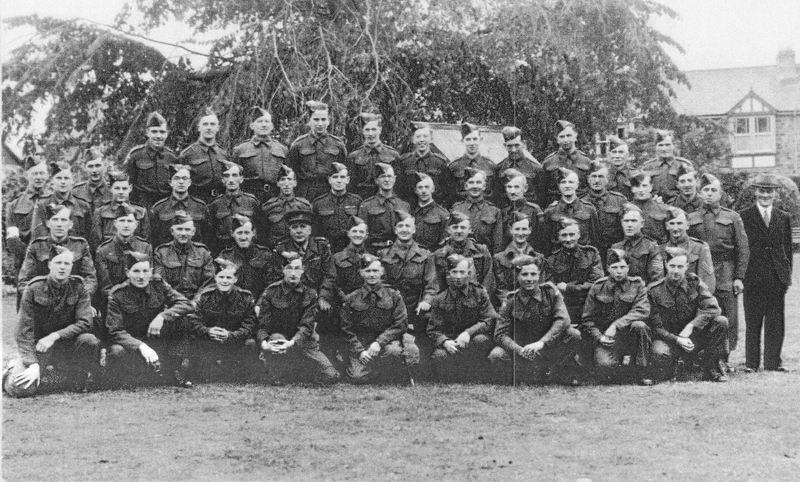 My late father in law is in this photo and I did not realise he had been in the Home Guard. Thank you.